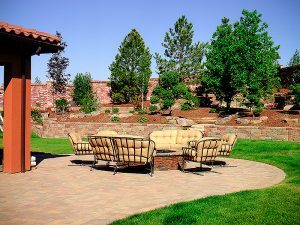 A Perfect Landscape’s comprehensive landscaping services include custom retaining wall construction, installation, and design for your Denver, CO residential or commercial landscaping needs. In the Denver region, landscapes can range from flat and level to very steeply graded. 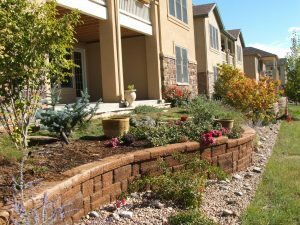 Our Denver landscaping contractors have vast experience in retaining wall construction and custom retaining wall design. We work with our customers individually come up with retaining wall ideas and designs you can enjoy for years to come. Our goal is to install retaining walls that are both functional and aesthetically pleasing for your outdoor living space. A custom retaining wall provides the foundation for a perfect commercial or backyard landscape. Retaining walls are often a necessity, especially in the Denver area, to control erosion and level out the hilly or sloped terrain. Our local landscaping contractors often suggest retaining wall construction to help shape your landscape and provide proper drainage for the Denver rain and snow runoff. The certified landscapers at A Perfect Landscape are experts at helping our Denver clients construct and install the most effective and intriguing retaining wall designs for their home or commercial property. The purpose of a retaining wall is to hold and shape soil where there is a sharp slope or hilly area in your lawn, to control erosion, and to provide a foundation for additional landscaping on difficult terrain. Our custom retaining walls are also often used to add dimension to flat land or as planting beds for garden landscaping. Our landscaping contractors are experts in providing hassle-free retaining wall construction, using a time-tested process. Here is a brief overview of the process for standard retaining wall construction for free standing walls, cinder block retaining walls, and other custom retaining wall installation. Create Retaining Wall Base: Retaining wall blocks must be set at the appropriate height below ground level according to the height of the retaining wall. Our landscaping professionals understand that a proper base is crucial for the retaining wall to last and perform properly. Compact Backfill: Retaining walls must have soil behind the wall, which is called backfill. Our landscaping team will determine the correct amount of backfill to create proper drainage that your landscape requires. Design Drainage Channels: Since water cannot pass through the retaining wall naturally, our retaining wall designs are custom-built to provide drainage channels to prevent cracking or bulges in your retaining wall blocks. This can be achieved with proper amounts of backfill, installing pipes, or adding holes to allow water to drain through the wall. Determining Proper Retaining Wall Height: The height of your retaining wall will have a direct correlation with how much weight it can hold. Standard residential retaining walls are generally between 3-4 feet high without the need for cantilevers or other reinforcements. We are also able to specially design and install large retaining walls that require additional engineering for your Denver commercial property. Retaining wall construction and design is most effective when done by professionals who perform all these steps correctly through the initial build process to avoid major maintenance and repair issues in the future. Get your retaining walls installed by the experts at A Perfect Landscape. 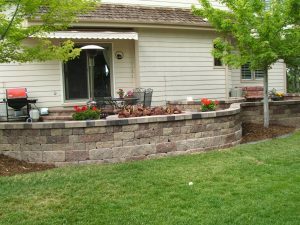 Call our landscaping contractors today at (720) 851-3034 for a free estimate and consultation on your custom retaining walls!